is a contemporary dance workshop by STRUT Dance Hofesh Shechter Instesive Workshop Scholarship Grantee in 2018. These three dancers will share their experiences and knowledge in 3 hours workshop. Razan started his interest in dance since he was 10 years old in hip hop dance, in 2015 razan joined Gigi Art of Dance & in 2017 he finished his 1 year internship & training program training under Gigi Art of Dance & worked as semi professional dancer in Gigi Dance Company, dance teacher assistant choreographer, also in production side such as stage management documentation, social media, administrator, etc. trained in contemporary, javanese traditional dance, and hip-hop. now he is continuing his study at Indonesia Institute of Arts Surakarta majoring in dance. 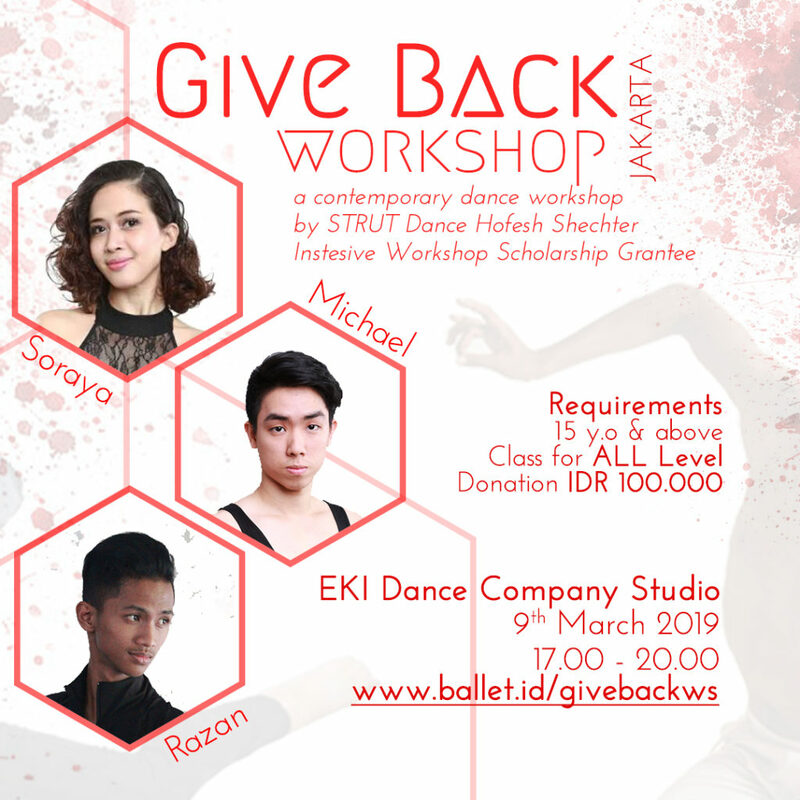 Last year, he got a scholarship from Ballet.id to join the Hofesh Schecter Intensive Workshop with Strut Dance in Perth . Began his training at the age of 12 at Marlupi Dance Academy. In 2007, he got a scholarship to join the Summer School in McDonald College, Sydney. In 2008, Michael participated in “Phyllis Bedells Ballet Competition” in London and Genee Award Ballet Competition in Singapore in 2009. After 8 years of learning ballet, Michael became the first male who was successfully awarded “RAD Solo Seal” in Indonesia. In June 2018, he joined the Contemporary Professional Intensive in Sydney Dance Company and in December 2018 he got a scholarship from Ballet.id to join the Hofesh Schecter Intensive Workshop with Strut Dance in Perth .